To Cite: Mokarami H, Mortazavi S B, Asgari A, Choobineh A. Work Ability Score (WAS) as a Suitable Instrument to Assess Work Ability Among Iranian Workers, Health Scope. 2017 ; 6(1):e42014. doi: 10.17795/jhealthscope-42014. Background: The high item numbers is one of the Work Ability Index (WAI) limitations that make it difficult to be completed by the workers. Using the single-item Work Ability Score (WAS) as a simple is one of the proposed solutions which is valid and suitable measure for work ability. Objectives: The present study aimed to assess work ability using WAI and WAS instruments and to compare their results among Iranian workers. Methods: This cross-sectional study was done on 1579 workers from eleven different work sectors located in different geographical areas in Iran. Work ability was measured by the full Persian version of WAI. Data were analyzed using univariate tests, Pearson product moment correlation, Gamma test, and multiple liner regression analysis. Results: The mean scores of the WAI and WAS were 39.95 ± 6.1 (range 15 - 49) and 8.1 ± 1.8 (range 0 - 10), respectively. Both the WAI and WAS showed the similar patterns of associations with the assessed independent variable. There was a strong correlation between the mean scores of WAI and WAS. In addition, the Gamma test showed that the categories of WAI were strongly correlated with the categories of WAS. Conclusions: The WAS could be used for reliable assessment of work ability among Iranian workers. To improve the worker’s work ability, interventional programs should focus on the alteration and correction of work schedule, and increasing the supervisor’s support for the young workers. 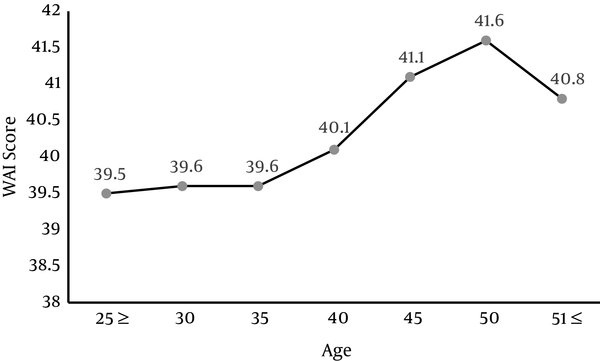 Young people consists the majority of Iranian workforce and according to the Iranian statistic center (2015) (1), of whom nearly 70% are ≤ 40 years old. On the other hand, similar to the other developing countries, Iran is experiencing a rapid ageing trend in its workforce as well as the low birth rates. It can lead to the big challenges and many social and economic problems for Iranian organizations and workers in the next few years (2). As a result, Iranian national health authorities such as Ministry of cooperatives labor and social welfare and ministry of health and medical education should focus on promoting and improving health and work ability of the workers over their working lives. One efficient strategy to achieve this aim is the early identification of workers at the risk of having deteriorating working conditions, by which interventions may be possible to extend their working lives (3, 4). Work ability is a multidimensional factor and depends on the balance between human resources (including physical, psychosocial and social health status, functional capability, values, attitudes, motivation, knowledge, and skill) and work demands (5, 6). Different objective and subjective methods have been used to assess the work ability. In the meantime, Work Ability Index (WAI) is one the most important and widely used instruments to measure perceived work ability, since it is inexpensive and easy to analyze (2). The obtained results are also nearly similar with the results from the clinical assessments (7) and it can predict early retirement and actual turnover (8, 9). This index is a valid self-report survey instrument that combines several dimensions of work ability (5, 10). WAI was developed by the Finnish Institute of Occupational Health (FIOH) to assess subjective work ability (11) and has been translated into 28 languages (12). This questionnaire has been translated and validated to Persian language by Abdolalizadeh et al. (13) in 2012. However, few studies have used WAI to assess the work ability of Iranian workers (2). In addition, such studies have been conducted in a city or a province with a few sample sizes. One of the WAI limitations is its high item numbers that make it difficult to be completed by the workers. One proposed solution is using the single-item Work Ability Score (WAS) as a valid, simple and suitable measurement for work ability (5, 14). The WAS is the first item of WAI scored from 0 (“completely unable to work”) to 10 (“work ability at its best”). The obtained results using the WAI and WAS are similar and they have satisfactory convergent validity (15). The achieved results can be used for systematic and primary screening of the large population of the employed workers (15, 16). Based on the best of our knowledge, assessment of work ability using this scale have not been investigated among Iranian workers. 1. WAI assessment of a large Iranian working population in several provinces and studying the relationship between WAI and age, gender, marital status, body max index, job tenure, educational level, work schedule, and the nature of work. 2. WAS assessment of a large Iranian working population in several provinces and studying the correlation between WAI and age, gender, marital status, body max index, job tenure, educational level, work schedule, and the nature of work. 3. Studying the possibility of using WAS, as a single item of WAI, to assess workability among Iranian workers. This cross-sectional study was done from 2012 to 2016. The subjects were invited to participate in the study and engage in eleven different job sectors including two hospitals (n = 187, response rate = 62.3%), three banks (n = 82, response rate = 56.2%) , one oil refinery company (n = 120, response rate = 63.2%), one oil exporting company (n = 443, response rate = 55.4%), one petrochemical company (n = 208, response rate = 58.8%), one cable manufacturing company (n = 39, response rate = 54.9%), one steel factory (n = 113, response rate = 80.7%), one cosmetic factory (n = 167, response rate = 87.9%), one fire station (n = 21, response rate = 91.2%), one dairy company (n = 92, response rate = 47.2%), and one sanitary equipment company (n = 107, response rate = 66.9%). The job sectors were selected based on the availability of their employees, their consent, the support from the employers, and locating in different regions to cover different regions of Iran. The work sectors were located in Bushehr, Golestan, Kohgiluyeh & Boyer-Ahmad, Kermanshah, Isfahan, South Khorasan, and Razavi Khorasan provinces. All workers of eleven sectors were invited and eventually a total of 1579 workers voluntarily agreed to participate in the study. All participants were informed about the aims of the research and signed a written consent, initially. To protect privacy and ensure confidentiality of the workers, questionnaires were filled out anonymously. The ethics committees of Trabiat Modares University, Birjand University of Medical Sciences, Yasuj University of Medical Sciences, and Sabzevar University of Medical Sciences reviewed and approved the ethical standards of the study. The full Persian version of WAI was used in this study. It assesses the following seven dimensions: (WAI 1 or WAS) “current work ability compared to lifetime best” (0 - 10 points), (WAI 2) “work ability in relation to the demands of the job” (2 - 10 points), (WAI 3) “numbers of current disease diagnosed by a physician” (1 - 7 points), (WAI 4) “the estimated work impairment due to diseases” (1 - 6 points), (WAI 5) “sick leave taken during the past 12 months” (1 - 5 points), (WAI 6) “personal prognosis of the work ability 2 years prior the study” (1, 4 or 7 points), and (WAI 7) “mental resources” (1 - 4 points) (5, 17). The WAI is calculated by summing the seven dimensions ranging from 7 to 49 points. The total score of WAI categorized as poor (7 to 27 scores), moderate (28 to 36 scores), good (37 to 43 scores) and excellent (44 to 49 scores). Also, the WAS categorized as poor (0 to 5 scores), moderate (6 to 7 scores), good (8 to 9 scores) and excellent (10 scores) (3, 5, 17). The psychometric properties of the Persian version of WAI were determined by Abdolalizadeh et al. (13). In the present study, internal consistency (Cronbach’s alpha) of the index was satisfactory (α = 0.77). The selected independent variables were age, gender, marital status, educational level, Body Mass Index (BMI), job tenure, the nature of work, and work schedule. Statistical analyses were performed using IBM SPSS Statistics 21 (USA, SPSS Inc.). Descriptive statistics were used to describe the characteristics of the participants. Univariate analyses of variance (ANOVAs) and independent t-tests were used to examine the effects of independent variables on the WAI score and WAS. The correlations between WAI and WAS scores and categories of WAI and WAS were obtained using Pearson’s correlation coefficient and Gamma test, respectively. The significance level was set at P ≤ 0.05. A multiple linear regression analysis (using the backward method) was used to predict WAI and WAS scores. Independent variables with P ≤ 0.05 were retained in the model. The majority of participants were male (88.0%). The mean age and the mean job tenure of all participants were 34.7 ± 8.0 and 9.4 ± 7.7 years, respectively. The mean scores of WAI for males and females were 40.1 ± 6.2 (range 15 - 49), and 39.1 ± 5.5 (range 24 - 49), respectively. Also, the mean scores of the WAS for males and females were 8.1 ± 1.8 (range 0 – 10), and 8.2 ± 1.7 (range 4 – 10), respectively. According to the job sectors, the highest mean ± SD scores of the WAI were observed among workers from company (43.2 ± 4.5) and the petrochemical company (42.1 ± 5.3). However, the lowest mean ± SD scores of the WAI were observed among workers from the cable manufacturing company (33.9 ± 8.4) and steel factory (36.0 ± 5.9). Also, similar to the results of the WAI, the highest mean ± SD scores of WAS were observed among workers from the oil exports company 8.7 ± 1.4) and the petrochemical company (8.4 ± 1.5), and the lowest mean (SD) scores of the WAS were observed among workers from the steel factory (7.0 ± 2.3) and the cable manufacturing company (33.3 ± 2.2). Descriptive statistics related to the seven dimensions of the WAI are presented in Table 1 which is organized by the job sectors. Abbreviations: WAI, work ability index; WAS, work ability score, α, Cronbach’s alpha. The categorized WAI and WAS scores according to the age are presented in Table 2. Overall, 25.9% and 28.2% of the workers reported the inadequate WAI (< 37 points) and the inadequate WAS (< 8 points), respectively. 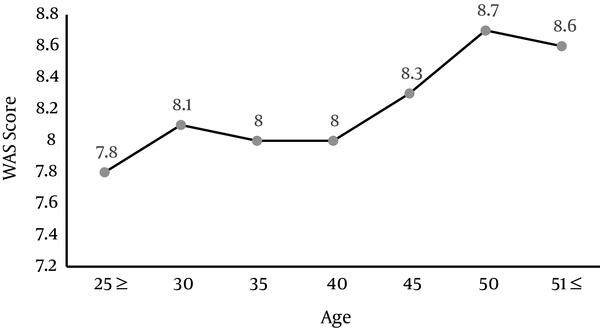 The proportions of the adequate WAI (≥ 37 points) and WAS (≥ 8 points) of the participants in the age group of 46-50 years were higher than other age groups. On the other hand, the highest proportions of the inadequate WAI and WAS were observed among participants in the age group of ≤ 25 (38.8%) and 26-30 (29.7%) years, respectively. The trend of the WAI and WAS scores according to the age group is shown in the Figures 1 and 2, respectively. The mean scores of the WAI gradually increased to the 45 - 50 years age group, and then decreased with the next age groups. The WAS trend according to the age group was generally similar to that of the WAI. Abbreviations: WAI, work ability index;WAS, work ability score. The results showed that the scores of WAI3 item (the numbers of current disease diagnosed by a physician) gradually decreased as age increased, and the highest and lowest WAI3 (mean ± SD) scores were observed among participants in the age group of ≤ 25 years (5.8 ± 1.8) and 51≤ years (4.5 ± 2.1), respectively. On the other hand, the scores of the WAI2 and WAI6 items gradually increased as age increased. According to the results of independent variables, the lowest mean scores of the WAI and the WAS primarily belonged to the physically demanding jobs followed by the two-shift schedule. By contrast, the highest mean scores of the WAI and the WAS were observed among participants in the age group of 46 - 50 years. The results of univariate statistical tests indicated that the mean scores of the WAI significantly differed according to the age (F = 2.5), gender (t = 2.1), educational level (F = 7.6), nature of the work (F = 10.2), job tenure (F = 3.4) and work schedule (F = 14.4) (Table 3). In addition, the mean scores of the WAS significantly differed according to the age (F = 3.7), marital status (t = -2.9), educational level (F = 4.1), nature of the work (F = 4.6), job tenure (F = 3.9) and work schedule (F = 4.2) (Table 3). The results of multiple linear regression analysis to predict the WAI and the WAS have been summarized in the Tables 4 and 5, respectively. Among the assessed independent variables, age, educational level, gender, work schedule, and nature of the work were significant predictors of WAI. Similar to the results of the WAI, independent variables including age, educational level, and work schedule were significant predictors of the WAS. aSelected as a reference group. The Pearson’s correlation coefficient indicated that the WAI and WAS scores were significantly correlated (r = 0.65, P < 0.001). Also, the Gamma test showed that the categories of the WAI were strongly correlated with that of the WAS (r = 0.79, P < 0.001). The results indicated that 86.5% of the participants with the adequate WAS were also belonged to the adequate category of the WAI. Furthermore, 57.4% of the participants with the inadequate WAS were also belonged to the inadequate category of WAI. The results of this study revealed that the WAI and WAS scores of the participants were in an appropriate level in most work sectors, except the steel factory and cable manufacturing factory. Similar results were observed regarding the relationship between independent variable with mean scores of the WAS and WAI, however more predicting independent factors were found for WAI than WAS. This study is the first study using WAS as an instrument to assess the work ability amongst Iranian workers. The results indicated that there was a strong relationship between mean scores of the WAI and WAS, and their categories, which can demonstrate WAS’s suitability to replace WAI for assessment of work ability among Iranian workers. The results of this study indicated that the mean scores of the WAI and WAS were inadequate among workers from the steel company and the cable manufacturer. Consistent with these findings, two studies (using WAI) have been found nearly the similar result among Iranian farmers (18), nurses, and healthcare workers (13). Nevertheless, the mean scores of the WAI (39.95 ± 6.1) and the WAS (8.1 ± 1.8) among all the assessed workers was at an appropriate level. Regarding the mean age of the studied population, who were mainly young, and their short job tenure, these mean scores are not at an appropriate level; so that nearly 30 percent of the workers had inadequate work ability. Gharibi et al. (2) claimed that one of the most important reasons for inadequate work ability among young Iranian workers can be resulted from the low job security and poor economies situation. This result can be a warning for Iranian national health authorities to pay attention to the working conditions and identify factors affecting the work ability among Iranian young workers. The functional capacities of the workers, especially physical abilities, gradually reduced with increasing the age and reached to the critical level around 45 - 50 years (5). It is biologically plausible that some dimensions of human resources, especially physical and cognitive capacities, decline with aging (4, 19, 20). Previous studies especially those which are conducted in the developed countries have been demonstrated that aging is strongly associated with the progressive decline in the WAI (5, 8) and WAS scores (15). Although in the current study a significant relationship was observed between age and mean scores of the WAI and WAS, by aging up to 50 years, the mean scores of the WAI and WAS were gradually increased and then a relative decline was found particularly in the mean scores of WAI. In parallel to these findings, Chiu et al. (21) by a study on the clinical nurses in Taiwan reported that the mean scores of WAI gradually enhanced up to the age group of 41 - 45 years and then rapidly decreased by aging. The same results were obtained by another study in Brazil (22). One important reason for this discrepancy between the developed and developing countries may be the difference in the age of workforce. In Iran, like many developing countries, the young people consist the dominant workforce population (1). Additionally, it is likely that this discrepancy can be due to the difference in demographic structure, education/training system, lifestyle, working hours, etc. (21). Furthermore, regarding the small number of participants older than 45 years compared to the lower ages in this study, “healthy worker effect (HWE)” can be effective in the WAI and WAS scores differences between age subgroups. Work schedule was one of the important independent variables that had significant effect on mean scores of the WAI and WAS. The workers who were working in two-shift work schedules had the lower mean scores of WAI and WAS compared to those had day and three-shift work schedules. It is documented that workers who had irregular work schedule undoubtedly suffer from physical and psychological health problems (23, 24). In this regard, Taghavi et al. (2014) (25) report that workers who have two-shift work schedule, have lower mean scores in some domains of quality of life. To our knowledge, there are no study assessing the effect of two-shift work schedule on work ability and most researchers have been focused on the three-shift work schedule and its related problems. Therefore, it is crucial to perform more studies on the problems of workers who have two-shift work schedule, and in particular, on their work ability. The results of this study also indicated that there was a strong correlation between the mean scores of the WAI and WAS. Sixty percent of the participants with the inadequate mean scores of WAS were located in the inadequate category of WAI. It can show the high relative sensitivity of the WAS for recognizing the workers with decreasing work ability. Additionally, almost 90 percent of the participants with the adequate mean scores of WAS were belonged to the adequate category of WAI indicating a very high specificity of WAS (by assuming the adequate and inadequate WAI categories as the standard). Therefore, WAS can be suggested as a low cost, user-friendly, and suitable measurement for the initial and quick assessment of work ability and also as a reliable alternative to the WAI among Iranian workers. Consistent with this deduction, El Fassi et al. (15) proposed the WAS as a suitable measure for systematic screening of work ability in the large-scale population surveys. In addition, the strong correlation between the mean scores of WAI and WAS has been previously well documented by other groups (14, 16). However, considering the multidimensional aspect of work ability WAS results should be cautiously used to assess work ability. A relatively large sample size from different work sectors and different geographical areas of Iran can be considered as the advantages of this study. However, one of the limitations of this study was the small number of female workers (15.5%). Accordingly, the results should be generalized cautiously to all Iranian workers, although the gender composition of the study was similar to that of the most workforces in Iran (1). Altogether, both the WAI and the WAS showed the similar patterns of associations with independent assessed variables in this study. The results of the present research indicated that the WAS could be used for reliable assessment of work ability among the Iranian workers. Moreover, investigation of work ability using the WAI and WAS demonstrates that regarding the young age of the workers, their work ability should be continuously assessed, and subsequently, prospective interventional programs must be implemented. It is suggested that interventional programs focus on the alteration and correction of work schedule and increasing the supervisor’s support for the young workers. Furthermore, a special attention is needed by Iranian national health authorities to job security of the workers to prolong their working lifetime and promote their working life quality. This study is part of the first author's PhD thesis and was conducted with financial support from Tarbiat Modares University and Iranian Oil Terminal Company (IOTC). The authors would like to gratefully acknowledge to the managers and the workers for their cooperation to conduct this study.